Jammin' Jambalaya Band,​ ​Band Source Productions, Inc. - The Jammin Jambalaya Band is the Ultimate Mardi Gras Band , Zydeco band and Second Line Band in Orlando, Florida. Zydeco Band Orlando Florida - Mardi Gras theme second line brass band. Let the good times roll with the sounds of Jammin' Jambalaya Band! performs your choice of Zydeco, Dixieland, Second Line Brass Band tunes, Jazz, Cajun, Blues that are sure to pack the dance floor, and get your second line parade started. The band specializes in corporate events, charity galas and private parties and is available as a strolling or stationary band, or as a combination of both. 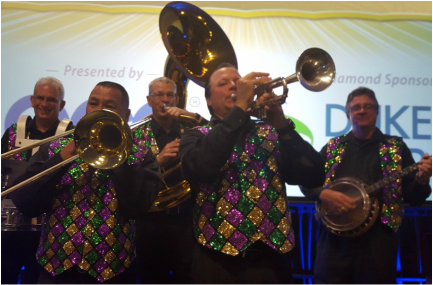 Band leader, trumpet player and vocalist Mark, leads the band with roof rockin' New Orleans favorites for your corporate Mardi Gras theme party, swamp theme event, Bayou fish boil or gala. If you're having a Mardi Gras event you have to have a live band! Nothing says New Orleans like the sounds of traditional New Orleans band that brings the house down. What sets this band apart is their ability to transition into contemporary music to pack the dance floor. Mark and his bands perform for over 140 events annually and are proud to be preferred vendors for Walt Disney World, Universal Studios, Disney Cruise Lines, The House of Blues, and frequently perform at the Breakers in Palm Beach, the Four Seasons Resort, the Ritz Carlton and many more. The band members are professional musicians in the Main Street Philharmonic at the Magic Kingdom. The Jammin' Jambalaya Band carries multi million dollar dollar liability insurance, which most venues require. The Band is available in a wide variety of costumes including Mardi Gras vests, Black shirt with white ties/fedoras Suits, or Western style shirts. The Jammin’ Jambalaya Band Orlando, Florida is a premier Zydeco band performing authentic Mardi Grass Entertainment for Fat Tuesday theme events. The Jammin’ Jambalaya band is a second line brass band performing for second line parades, wedding receptions, Mardi Gras and Zydeco theme events. The Jammin’ Jambalaya Band is available as a strolling Dixieland band and second line brass band. 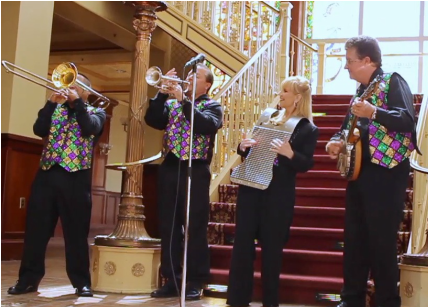 Our Zydeco and Mardi Grass band is located in Orlando, Florida and offers New Orleans theme entertainment.